An APR file is an ArcView Project File available only to users of ArcView, a desktop GIS (Geographic Information System) software developed by ESRI (Environmental Systems Research Institute, Inc. (ESRI). 1) Views - collections of geographical features grouped in themes (which represent the features as points, lines, or polygons); 2) Tables - collections of attribute data linked to spatial features; 3) Charts - graphic representations of attribute data of a table; 4) Layouts - collections of ArcView documents in map format; and 5) Scripts - a computer program that adds new capabilities to ArcView, automates tasks, and builds customized applications. In other words, a project file is an index of all the information on files of ArcView - like the size of the view window, the different themes of the view, where the shape files are located and so on. Once a project file is saved, it is given the extension APR; therefore, it is also called an APR file. APR files are text (ASCII) files that also contain pointers, or paths, to the physical location of the information documents, as well as user preferences like window sizes and colors. These paths may be edited using any text editor like Notepad or Word Pad. 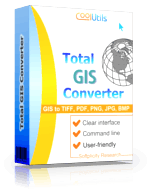 To convert APR files to TIFF, JPEG, PDF, BMP, PNG use Total GIS Converter.